With two wins under his belt after his first January camp, Gregg Berhalter will turn his attention to the two international friendlies during the March window -- March 21 against Ecuador in Orlando and March 26 against Chile in Houston. Whom he'll bring in -- players in Europe, MLS and Mexico not called into or available for the January camp and players who stood out in the wins over Panama and Costa Rica -- is guesswork at this point. But he had given lots of hints since he was appointed in early December about how he wants to play -- and he has said repeatedly that's in view of how he sees his full squad of players. 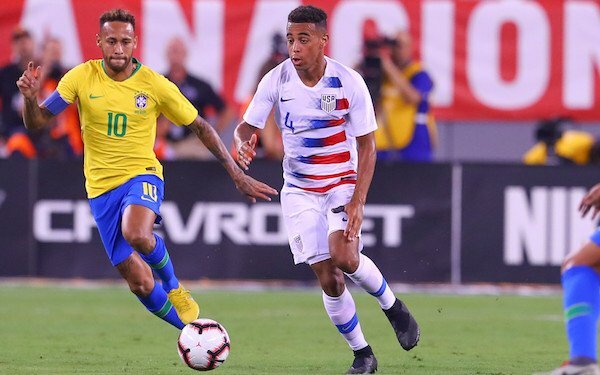 The good news is that the wins over Panama and Costa Rica, albeit against weak opposition, gave Berhalter a framework on which to build. More good news has come from Germany, where five players 20 years old or younger -- Christian Pulisic, Weston McKennie, Haji Wright, Josh Sargent and Tyler Adams -- have played in the Bundesliga this season though form -- and playing time -- for the first four have been up and down. Adams just arrived at RB Leipzig, has started the last two games and been outstanding. Even younger players offer even more promise -- Alex Mendez at Freiburg, Richie Ledesma at PSV, Sergino Dest at Ajax come to mind -- but it will probably be at least a year before their progress will be ascertained to know whether they are indeed ready to fit into Berhalter's plans. That shouldn't minimize what is a major rebuilding job Berhalter is facing -- the program peaked a decade ago when it finished second at the Confederations Cup -- and how small the pool of talent he has to work with is relative to the top national team programs in the world. Just as many of Berhalter's selections for January camp were surprises -- few would have imagined Nick Lima, Daniel Lovitz, Corey Baird and Djordje Mihailovicall starting both matches -- so too will be some of his call-ups in March. Berhalter has admitted that he picked some players at the expense of other players because they fit into the system he is introducing. The one thing that should make it easier now is we've seen that system and how he wants to shape the team. -- Playing out of the back. The national team's weak link for years. 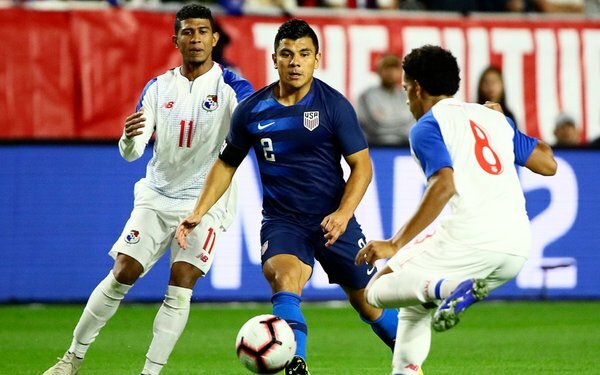 The USA did better in the second half against Costa Rica -- but that was partly due to the fact that the Ticos were gassed and pulled back. -- One holding midfielder. Michael Bradley and then Wil Trapp provided cover in front of the two central defenders, Aaron Long and Walker Zimmerman, and behind the two attacking midfielders, Cristian Roldan and Mihailovic, but they also were the first line of attack, essentially serving as playmakers. -- Wing play. Again, no surprise, given the Crew's success during Berhalter's tenure. By spreading the game out, Berhalter believes his team can put itself in dangerous positions. Three of the five goals against Panama and Costa Rica came via assists from wingers -- Baird on the first goal against Panama and Jonathan Lewis on the third goal against Panama and the late winner against Costa Rica. -- Pulisic? He has mostly played on the right wing in a three-player attack for Borussia Dortmund but played inside for much of the time for the USA in the Hexagonal. Berhalter will likely fit Pulisic into the role Baird played -- out wide on the right -- against Panama and Costa Rica. -- Adams? He has played as a No. 6 for RB Leipzig, seeing a lot of the ball in two commanding wins, but he doesn't have to be the playmaker for Die Bullen that Bradley or Trapp is for the USA because he has better ball-handlers around him. Adams could be the most impactful in the right back/central midfielder role Lima played. Paired together on the right side, Pulisic and Adams would give the USA a pair like it has never had before -- and a pair that could be together for a decade. The left side? Still, a work in progress. Antonee Robinson (just starting to train again after ankle surgery) gives Berhalter the vertical player he is looking for though his defending leaves, for now, something to be desired. (George Bello is heir apparent at left back though he only just turned 17.) In front of him, Tim Weah is the obvious choice, but he still may end up being a center forward, the position at which he is being used off the bench at Celtic. Berhalter has not said what he has planned if at all for Darlington Nagbe -- who was rested along with Atlanta United teammate Brad Guzan in January because of their short offseason -- but Nagbe could play the left wing role, tucked in ahead of a more vertical left back, that he occupied for much of Bruce Arena's short tenure or play alongside McKennie in the two attacking midfield spots. After that, Berhalter has lots of choices, giving us a month, into the first two weeks of the MLS season, to try to fit them together. 12 comments about "Fitting Gregg Berhalter's lineup pieces together is puzzle". Brad Matheny, February 6, 2019 at 8:48 a.m. I like Lovitz at left back. He was composed and granted a bit conservative in getting forward. Robinson is pure explosive speed and with that comes the need to groom and calibrate recognizing when situations signal the overlap; he may be the future #3. But: prefer a seasoned workhorse to get us through qualifying, develop youngsters in parallel and reassess constantly. Players readiness can change quickly due to numerous factors biggest being fitness (including injury) and psychosocial. bigger teams with lethal 7, 9 & 11s (i.e. Mbappe, Aguero). Hoping dropping Trapp off to create numerical advantage with 2 & 3 will shut the door. Christopher Osmond, February 6, 2019 at 8:53 a.m.
We need a #10. A true playmaker: One who can provide that incisive pass; turn under pressure breaking the lines or press; and hopefully, can score. This is my worry that this player has yet to materialize out of what is looking like a wonderful U - 20's class. frank schoon, February 6, 2019 at 11:48 a.m.
As far as I'm concerned these games are really tryouts for to see which players can cut the mustard with the European players are fitted. Bob Ashpole replied, February 6, 2019 at 1:08 p.m. I agree Frank. The description of the "keys" of GB's style of play is too much of a generalized statement of conventions to be meaningful in my view. I actually thought the second match was a step backwards as far as attacking team tactics went. frank schoon replied, February 6, 2019 at 1:23 p.m.
frank schoon replied, February 6, 2019 at 1:39 p.m.
Bob ,the keys ARE so general, for they are really meaningless without taking into account a more detailed technical analysis of the players, weakness and strenghts, themselves. That is why all this talk of Tactics ,the X's and O's are such meaningless drivel..... That's like that post made about GB copying Guardiolas tactics, as if we have the players that Guardiolas has. LOL. Bob Ashpole replied, February 6, 2019 at 2:21 p.m. Watched the clip. He strikes really well. I actually thought I saw the ball knuckle before it reached the keeper. That looked like a field in Fairfax County. Glad I am here where the weather is comfortable. frank schoon replied, February 6, 2019 at 2:37 p.m.
beautiful game, February 6, 2019 at 5:51 p.m.
Coach GB can have whatever plans he wants, except having Bradley & Zardes on the NT. It is time to rehaul the squad with fresh blood that brings something to the table.., everyone knows what B & Z bring to the table. frank schoon replied, February 6, 2019 at 6:36 p.m.
Bob Ashpole replied, February 6, 2019 at 9:32 p.m.
Look, say whatever you want about Zardes, but he clearly was not any MNT coach's first choice No. 9. That should not reflect on him personally. I am confident that he is loyal and does the best he knows how when and wherever he is put in a match, but that is not your complaint. So what matters to me is what you think of the injured Jozy Altidore who appears to me to be who Zardes is standing in for. They are similar players. Altidore is the real question, not Zardes. I would be happy to see Bradley go from the pool but not until there are enough better CMs in the pool. I don't think that is going to happen soon. This last match was an important test for Trap. Fortunately for Trap's international career, the coach didn't substitute him after his poor first half. I am going to be optimistic and think that next time against a competitive opponent Trap can give the team a good 90 minutes instead of just one half. The coach must believe in his potential or else he wouldn't have selected him for the camp. But I don't think he can afford another half like that first one. beautiful game, February 10, 2019 at 3:29 p.m.
Bob A., I'm not criticizing Zardes as a person, but a player. If I may suggest, no one should be taking Altidore's place...someone has to beat Altidore out of the squad. I'd rather try out a youngster with talent and than utilize Zardes as a fill-in. That's a wate of time and opportunity. Bottom line people, if someone can't deliver on a consistent basis, hasta la vista.